Hello friends! My name is Lacy or Rosalyne. I have been pagan for a long time but I am now in a place in life I can begin practice! I live in the southern United States so I have to keep in the broom closet! 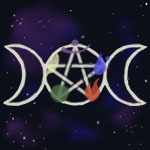 Haha I am coming here to search more witchy friends and trade information, there aren't any groups in my area so I am hoping to get some good advice and ideas on my own life. I haven't found a particular path or dieity to follow yet but I try to at least follow the wheel of the year. So that's about it! Hit me up I would love to be friends! Welcome to the forum. I live in the southern area of the US as well so believe me I get not being open about your practices. I'm sure you will find much of what you are looking for here as there is a wealth of information. Thank you Chrysanthe! I am in Georgia, what about you? livinglikelacy wrote: Thank you Chrysanthe! I am in Georgia, what about you? Yep. Georgia here as well. Howdy Lacy. I am also in the southern U.S. I live in Ft Worth Texas. Welcome to the forum. Thank you for your kindness! I have been in other forums before and this is by far the most welcoming community I've seen. I'm pretty crippled up and in a hospital bed in my living room. The only problem will be the length of the e-mails I'll send. I can hear the groans of discomfort now.